Decades of research have generated a myriad of theories of investors’ motives and beliefs. For example, investors may fear rare economic disasters akin to the Great Depression (Rietz 1988, Barro 2006, Barro and Ursúa 2012). Individuals’ portfolio choices may be driven by a concern about how their current consumption compares to their own past consumption (Constantinides 1990) or the consumption of those around them (Campbell and Cochrane 1999). Background risks such as the possibility of a health or unemployment shock might also be important determinants of investment allocations (Pratt and Zeckhauser 1987, Bodie et al. 1992). Although a great deal of progress has been made, testing these theories remains difficult. Economists typically try to infer motives and beliefs by observing prices, quantities, and choices. But convincingly performing this sort of indirect inference is challenging in investment contexts because we usually cannot conduct randomised experiments in such settings, and ‘as if randomised’ natural experiments are rare. When experiments and quasi-experiments are available, they are almost always confined to a special subpopulation or setting, making their generalisability uncertain. their beliefs about the cross-section of individual stock returns. Rather than a small number of dominant factors, we find substantial support for many of the leading theories of what drives portfolio equity shares. 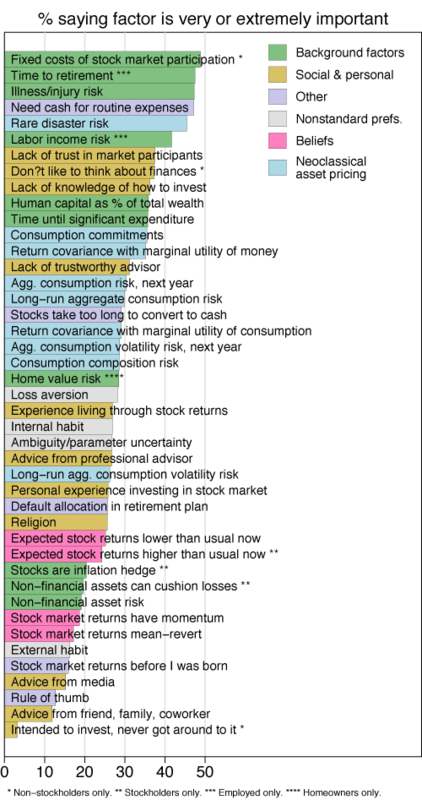 Among motives coming from representative-agent asset pricing models, we find especially strong support for fear of rare disasters, with 45% of respondents describing concern about economic disasters as a very or extremely important factor in determining the current percentage of their investible financial assets held in stocks. Other factors receiving substantial support include consumption commitments that are difficult to adjust in the short run (described as very or extremely important by 36% of respondents), stock return covariance with the marginal utility of money (35%), and long-run aggregate consumption growth risk (30%). Turning to theories that have tended to be applied to portfolio choice at the individual level, we find strong support for the importance of time until retirement (48% of employed respondents) and time until a significant non-retirement expense (36% of all respondents). Background risks such as health risk (47% of all respondents) and labour income risk (42% of employed respondents) are frequently rated as very or extremely important. Discomfort with the market is also widespread, with 37% citing lack of trust in market participants, 36% citing a lack of knowledge about how to invest, and 31% citing a lack of a trustworthy adviser. Transactional considerations which have received scant consideration in the academic literature – needing to have enough cash on hand to pay for routine expenses (47%) and concern that stocks take too long to convert to cash in an emergency (29%) – are also salient. Non-participation in the stock market is frequently driven by the fixed costs of participation (49% of non-participants) and not liking to think about one’s finances (37% of non-participants). Regarding mutual funds, we find that 51% of respondents who have purchased an actively managed equity mutual fund report having been motivated by a belief that the active fund would give them a higher average return than a passive fund. At the same time, 27% cite a hedging motive – the belief that the active fund would have lower unconditional expected returns than the passive fund but higher returns when the economy does poorly. The recommendation of an investment adviser was very or extremely important for 48% of active fund investors’ decision to buy an active fund. 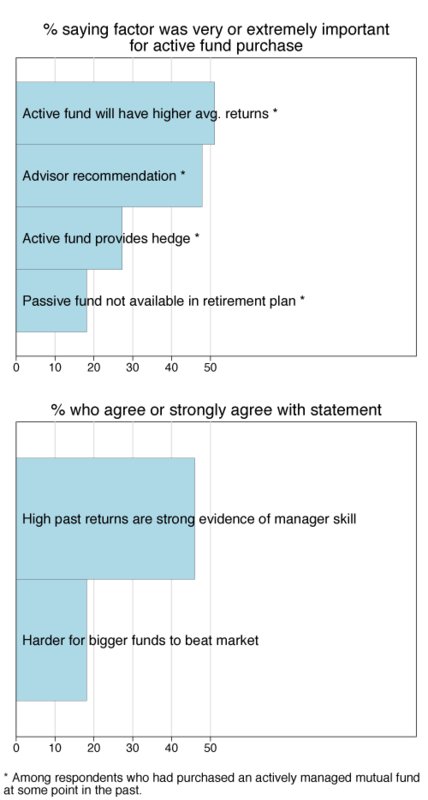 Consistent with Berk and Green (2004), 46% of all respondents agree or strongly agree that a fund having outperformed the market in the past is strong evidence that its manager has good stock-picking skills. But inconsistent with Berk and Green (2004), only 18% agree or strongly agree that funds have a harder time beating the market if they manage more assets. Finally, we find that collective expectations about the normal relationship between a stock’s characteristics and its expected returns do not always match the historical correlations. Similar proportions of respondents expect value stocks to normally have lower average returns than growth stocks as believe the reverse (28% versus 25%). On the other hand, consistent with the historical relationship, more respondents expect high-momentum stocks to normally have higher average returns than low-momentum stocks (24%) instead of the reverse (14%). Forty-four percent expect value stocks to normally be less risky than growth stocks, while only 14% believe the opposite. Twenty-five percent expect high-momentum stocks to normally be riskier, while 14% expect them to be less risky. Many respondents believe that these stock characteristics are not correlated with expected returns or risk, or have no opinion on the matter. To be sure, survey methods have limitations. Respondents might give careless answers, the meaning of qualitative responses such as “extremely important” probably varies across respondents, and individuals might not fully understand the true motivations for their decisions. Nonetheless, we believe that survey responses do contain meaningful information, just as ordinary conversations can convey meaningful information about beliefs and motives despite being subject to similar pitfalls. Since the empirical methods more commonly used by economists also have limitations, survey data are a useful addition for triangulating towards the truth. Barro, R J (2006), “Rare disasters and asset markets in the twentieth century”, Quarterly Journal of Economics 121: 823-866. Barro, R J and J F Ursúa (2012), “Rare macroeconomic disasters”, Annual Review of Economics 4: 83-109. Berk, J B and R C Green (2004), “Mutual fund flows and performance in rational markets”, Journal of Political Economy 112: 1269-1295. Bodie, Z, R C Merton, and W F Samuelson (1992), “Labor supply flexibility and portfolio choice in a life cycle model.” Journal of Economic Dynamics and Control 16: 427-449. Campbell, J Y and J H Cochrane (1999), “By force of habit: A consumption-based explanation of aggregate stock market behavior”, Journal of Political Economy 107: 205-251. Choi, J J and A Z Robertson (2018), “What matters to individual investors? Evidence from the horse’s mouth”, NBER Working Paper 25019. Constantinides, G M (1990), “Habit formation: A resolution of the equity premium puzzle.” Journal of Political Economy 98: 519-543. Pratt, J W and R J Zeckhauser (1987), “Proper risk aversion.” Econometrica 55: 143-154. Rietz, T A (1988), “The equity risk premium: A solution.” Journal of Monetary Economics 22: 117-131.